A hands-on guide to help your nonprofit build its brand, raise its profile, strengthen impact and develop deeper relationships with donors, volunteers, and other stakeholders. 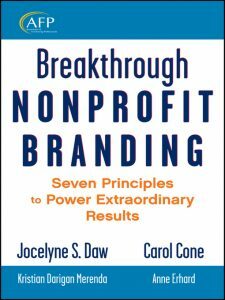 Breakthrough Nonprofit Branding is about the power a constituency-focused, compelling brand can have to revolutionize an organization and the way people view and support it. A practical road map and essential tool for nonprofit leaders, board members, and volunteers, this book reveals the vital principles you need to know to build and manage your organization’s most valuable asset – its brand. In today’s highly competitive nonprofit world, building a breakthrough brand is no longer a „nice to do,“ but the new imperative. Jocelyne Daw, a pioneer and leader in building business and community partnerships has over 25 years of nonprofit leadership experience. Carol Cone, named by PR WEEK as the most powerful and visible figure in the world of cause branding, has been linking companies and causes for over 25 years.